← What’s a seed worth? Do pull out as many as you can before they flower to reduce next year’s crop. Do mulch heavily with newspaper/cardboard and then woody mulch to smother them and slow down their progress. Sheets need to overlap very thoroughly! Try no-dig gardens on top of them. Invite bettongs to dig them up and eat the bulbils! If all else fails, appreciate that the soursobs can actually disguise your little vegetable seedlings and protect them from being eaten while they are getting established. THEN pull the buggers out before they flower!! And if they’re too much to manage on your own, give me a call – my kneepads and gloves are at the ready!! P.S. don’t stick them in the compost either – just another great way to spread them. 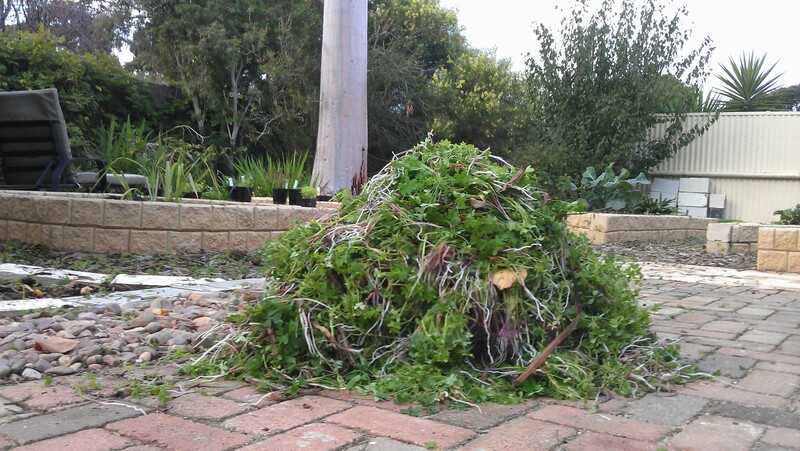 Either the green bin (commercial composting is hot enough to destroy the bulbils) or let them drown in a bin of water to make stinky weed tea fertiliser. This entry was posted in autumn, maintenance, weeds. Bookmark the permalink.